As in so many other areas of trial practice, it is important to go back to the jury instructions in order to remind ourselves what jurors are ultimately going to be asked to decide. CACI 3905A states that, in a personal injury case, the jury may award non-economic damages for “past and future physical pain / mental suffering / loss of enjoyment of life / disfigurement / physical impairment / inconvenience / grief / anxiety / humiliation / emotional distress / [insert other damages].” Reading that instruction we see that “pain and suffering” is really just lazy shorthand for a host of distinct types of non-economic damage for which our clients may seek compensation. 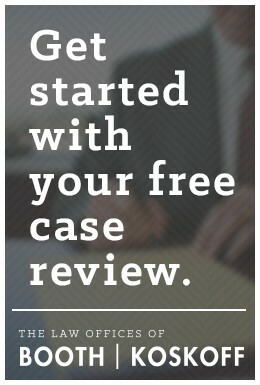 At the outset, you should determine which of these items apply to your case. Be creative and expansive at first. 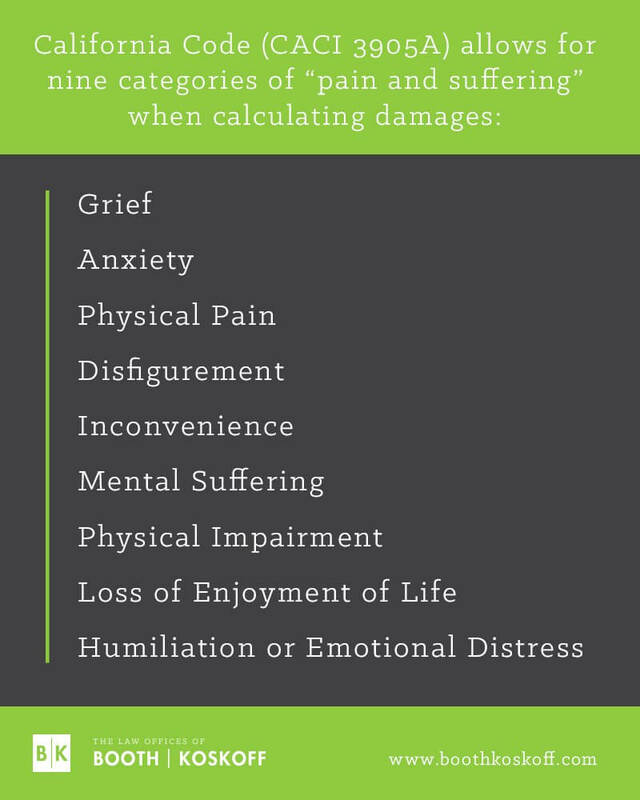 Write down each one of these elements and make a list of the ways in which your client has suffered each loss. Include separate lists for the past and future version of each item. Potentially you could have as many as 20 different harms for which you may seek damages. While most cases will not have quite that many that will truly apply, you can almost always get to at least 10. This is an important process because it forces us to think about the various ways, large and small, that our client’s injuries have affected his or her life and will continue to do so. If we find that our list is rather short, that is a good reminder that we need to sit down with the client and explore more fully how he or she has been harmed. Through that process we will not only expand our list, but we will undoubtably come up with specific anecdotes that will really drive home the reality of the client’s suffering. Even in relatively “small” injury cases, this process can greatly expand the value of the case at trial. Physical pain. This is fairly straightforward, but should not be glossed over. What was the pain like in the immediate aftermath of the accident? If the pain has persisted, have your client describe it in detail. What must she endure in order to carry out her daily responsibilities? Chronic pain has a way of placing a cloud over the plaintiff’s head and affecting all of her waking moments. What do the medical experts say about whether the plaintiff’s pain is likely to persist indefinitely into the future? Mental suffering. No one likes a whiner, but the plaintiff needs to allow the jurors to get inside his head and walk in his shoes a bit. What is his mental and emotional state like, on a day-to-day basis, as he is forced to deal with the injuries that the defendant inflicted on him? Loss of enjoyment of life. This is a very powerful concept to which jurors can easily relate. What pre-accident activities used to give your client enjoyment and meaning and why are those no longer viable options for her? How have everyday activities like playing with her children been taken away or robbed of their joy? Do chronic pain and discomfort dominate her life to the point where there is simply no room for joy and happiness? Disfigurement. This item will not apply in every case, but when it does, it can be very important. A burn victim, for example, will have to deal with not only the physical pain and discomfort associated with serious burns, but also the embarrassment and social anxiety associated with permanent scarring. Physical impairment. This item gives us a good opportunity to talk about the tangible ways in which our client’s life has changed. How is the plaintiff impaired in his ability to work, to enjoy hobbies, to take care of basic activities of daily living? Even jurors who resist the idea of awarding substantial money for physical and mental pain can usually appreciate that when the defendant’s negligence has taken away something concrete from the plaintiff’s life, there should be reasonable compensation for that. Inconvenience. This sounds somewhat unimportant, but when multiplied by all of the many times that it arises it can become quite significant. It may be merely inconvenient the first time the plaintiff has to ask her husband to help her get dressed in the morning. But when she has to make that request every single day, year after year, that inconvenience becomes something much more insidious. Grief. Although usually associated with wrongful death cases, grief can be a powerful concept to discuss in the context of catastrophic injuries. Plaintiffs truly do grieve over the loss of use of a limb, the loss of the ability to exercise, the loss of a career that provided fulfillment and self-esteem, etc., particularly when that loss is permanent. Anxiety. Sometimes the fear of the unknown is worse than dealing with the harm that is right in front of us. Plaintiffs often worry a great deal about whether they will be able to support their families or take care of themselves as time goes on. Even if the plaintiff is back to work now, he may experience tremendous anxiety about whether he can continue to work through the pain and restrictions caused by his injuries or whether his employer will continue to want to put up with those restrictions. Humiliation/emotional distress. These concepts are more likely to apply when the focus is on the plaintiff’s psychological or emotional (rather than physical) injuries, such as sexual abuse cases. In that context, they can be extremely powerful. Throughout trial, including voir dire, opening statement, witness examinations and closing argument, we can work in a discussion of each item of non-economic damage that is applicable. In closing, we have the option of asking the jury to assign a specific dollar figure to each item and then adding each of those individual numbers together to reach a total general damages award. Why is this an advantage? Because some jurors will be reluctant to award a large figure for something as amorphous and maligned as “pain and suffering.” By breaking up “pain and suffering” into its component parts and separating the past loss from the future loss, we allow jurors to place smaller, more palatable figures on individual items. When added together, those smaller figures may very well result in a total general damages figure that represents fair compensation for the plaintiff’s injuries. To the extent that a particular juror de-values certain losses, such as physical pain, that does not have to drag down the entire award significantly if, for example, that juror places great value on the plaintiff’s physical impairment or anxiety. In other words, you greatly increase your odds of reaching jurors emotionally and motivating them to award large numbers if you provide them with a number of different avenues for reaching that result. This same approach can be applied with equal success in wrongful death cases. CACI 3921 and 3922 break up general damages in these cases into nine factors (loss of love, companionship, comfort, etc.). For the very same reasons discussed above, presenting each of these items as a separate, distinct loss and asking jurors to consider and quantify each one separately can lead to a much bigger general damage award than would result from a more generalized approach.